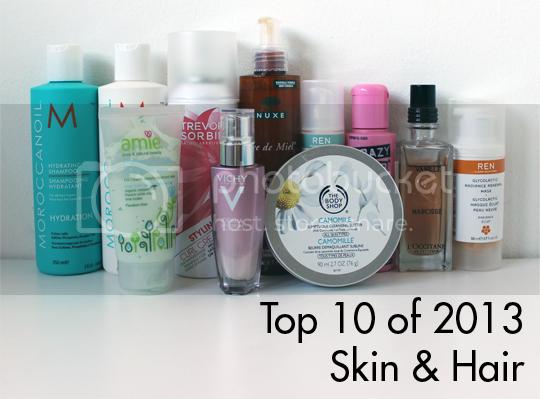 Ok, last one before 2014 can really begin – my favourite products of 2013 for skin and hair. 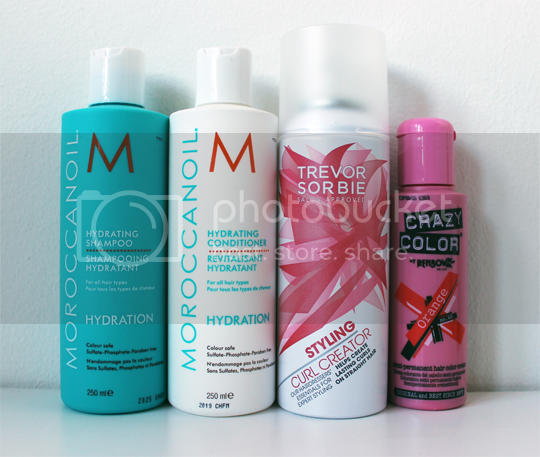 Moroccanoil Hydrating Shampoo & Conditioner – Over my (almost) five years of blogging, I have discovered that in many cases, particularly when it comes to what you use on your hair, you get what you pay for so I don’t mind shelling out for these. I’ve described my pain-in-the-arse hair type many times before but just in case, it’s thick and frizzy, naturally very curly and the roots are super oily (thanks dad) whereas the ends are super dry (thanks mum). These two help towards hydrating the ends and teamed with Moroccanoil Treatment, they’re pretty much an unstoppable combination. You don’t need a lot, either, so they’re not terribly expensive in the long run. You can grab the duo at Lookfantastic for £33.80. Trevor Sorbie Curl Creator – Another good’un for the curly girls out there. I can’t speak for how well this works at creating a curl on naturally straight hair, it does wonders for adding texture, definition and separation for my natural ones. I’ve reviewed it in full here, and you can find it at Boots for £5.59. Crazy Color Hair Dye in Orange – Inventive name, huh? Since I returned to the realm of the ginge, I’ve been relying on this particular semi-permanent colour to keep my carrot-top topped up. It’s a bargain, it’s easy to use, it doesn’t smell and well, there’s nothing not to like really. It’s never had a dedicated post of its own, but you can see my hair freshly dyed with it in this post. Find it direct from Crazy Color for £4 (or £12 for 4 bottles, which is how I buy it!). Nuxe Reve de Miel Cleansing Gel – This bargainous French badboy has been my daily cleanser since mid-February. I have never, ever stuck with one skincare product for so long, so that definitely speaks volumes. This is so gentle that it doesn’t exacerbate the inherent oiliness or underlying dryness of my skin, it’s so quick and easy to use and my skin always feels lovely and supple afterwards. Whether I’m using it with just my hands, a flannel, cleansing sponges or my Clarisonic, it’s just a lovely and versatile product that I’ll repurchase for as long as it exists. I first reviewed it here, and also featured it in a ‘Forever Repurchased’ post here. Find it at Escentual for £12. REN Hydra-Calm Day Cream – It took a long time to find a good daytime moisturiser that would offer adequate hydration but not break through my skin and turn my makeup into an oily mess by lunchtime. I finally found what I was looking for in REN’s Hydra-Calm Day Cream, which I featured in a post on quick fix morning skincare. You can pick it up from a ton of stockists including M&S Your Beauty for £27. Vichy Idealia Life Serum – This serum from another of my French favourites, Vichy, is designed to combat the effects of the environment and our lifestyle choices rather than targeting one specific skin type. Think along the lines of pollution, smoking (not that they encourage it, of course), an unhealthy diet, etc. Truth be told I couldn’t even begin to quantify those sort of results – although I am a smoker – but my skin has definitely seen an improvement in terms of clarity since starting using this in July. You can find it at Escentual (where else would you possibly go for French skincare, huh?) for £29.50. 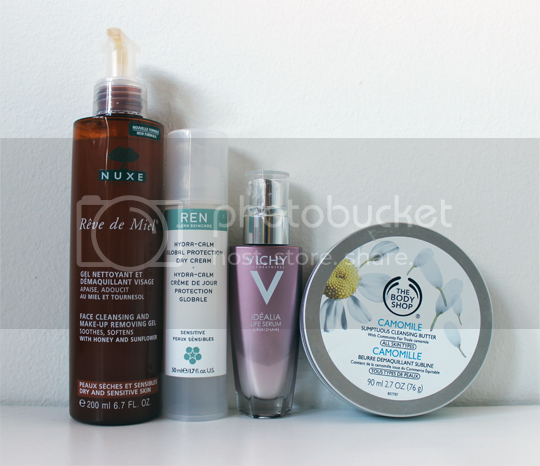 The Body Shop Camomile Cleansing Butter – Sometimes, there are days when my beloved Nuxe gel just won’t do. Occasionally, I will get a particularly dry day. These days often come when I’ve had a lazy weekend and not worn makeup on one day and therefore not felt the need to properly cleanse, tone and moisturise (see? Lazy). When this happens – which is no one’s fault but mine, I know! – I crack out this supremely hydrating cleansing butter. I slather it on generously, leave it to work for 10 minutes in mask-like fashion and remove with a flannel and warm water to reveal skin that you’d never know I’d been abusing. Fabulous stuff. Pick it up from The Body Shop for £12. REN Glycolactic Radiance Renewal Mask – It seems REN can do no wrong for me, since I’m on my second tube of this brightening badboy. It does exactly what it says on the tin, providing a fresh, radiant complexion that I can’t get from any other product – I’ve extolled its virtues in full here. REN have plenty of stockists, or you can grab it directly from them for £30. 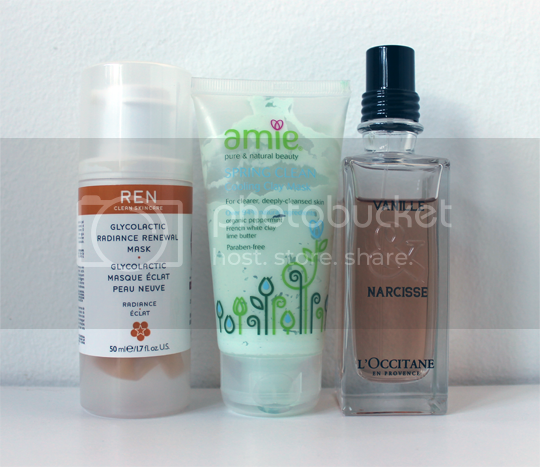 Amie Spring Clean Cooling Clay Mask – I’m on tube number two of this, too! I’ve mentioned it more than once, so you may be aware already of how much I bloody love it. Nothing beats this for a seriously refreshing, pore-blasting deep clean and it’s shockingly affordable for something that just works so damn well. You can read more gushing about it in my original review here, and then you can skip off to Boots and get one for yourself at a ridiculous here, and if you like the sound of it you can find it on L’Occitane’s site for £49. *Exhales* aaaand that’s it! My thirty favourite products of 2013, all wrapped up. Did any of your own personal favourites crop up in any of my lists? If you’ve done any similar posts, please do point me in their direction, I’d love to have a read. I have combination skin that gets flaky & clogs my pores if I don’t keep it hydrated properly. It’s also quite sensitive, so I’ve to choose my products carefully if I don’t want to break out. I haven’t been able to find this in a while, but if you can get the Olay Quench in-shower moisturizer, it works great on your face too. It only stays on for a few minutes & then you rinse, like your hair conditioner, so it doesn’t clog anything up. That was such a helpful comment, thank you – I’ve not heard of that particular Olay product before but I’ll definitely be keeping an eye out!